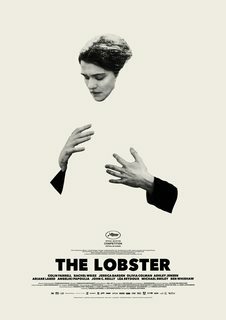 What is the meaning of this poster for The Lobster? 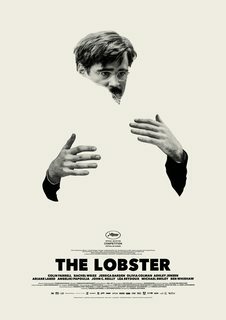 In this poster for The Lobster we see Colin Farrell in an incomplete form, but in viewing the movie I don't remember seeing anything similar to what the poster is suggesting or related to it in any way. What meaning is this poster trying to convey? So the poster suits quite well to the story as the void represent the missing partner quite well. Note: I have not seen the film but the poster complemented the IMDb synopsis quite well for me. In addition to Ankit Sharma's answer, I think there's a second meaning. During the movie, the short-sighted woman (Rachel Weisz) loses her sight. She's no longer able to see the person she loves. (And she loses it because she loves him.) It's implied at the end of the movie that David (Collin Ferrel) is going to blind himself, leaving him also unable to see his lover. Once they're blind, they will only be able to feel their lovers embrace, but not actually see them. I think the poster represents that fairly well. And always was sure that those voids (apart from metaphor for being lonely and chasing something that just does not exist) are actually sort of shaped in form of lobster claws. The Lobster is actually absurdly humorous for a while. It takes a turn to the dark side and never comes back. In spite of the dark content, it does still manage to coax a smile at the absurdity of people, now and then. I feel like the underlying theme is loneliness and isolation. The poster captures that feeling. The answers above are correct. I would like to add that the shape of the arms of the protagonist resemble claws of a lobster. Not the answer you're looking for? Browse other questions tagged analysis posters the-lobster . What is the meaning of the butterfly? What is the “moral” in Elite Squad (Tropa de Elite)? 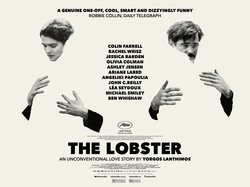 What is the actual meaning of the film “The Lobster”? Why is 'loner leader' / Léa Seydoux against love in “ The lobster ”? Why did she kill the donkey? Is the movie “Killing of a Sacred Deer”, a metaphor or allegory? What is the significance of mirrored N in the title of The Nun? What was the ending of Night Moves about?